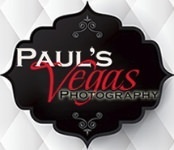 Here at Paul's Vegas Photography in Las Vegas, Nevada we know that photography on your wedding day is one or the most important choices you will make. We strive to bring you the best at the most affordable price. Now is the best time to take advantage of our Spring special. This special pricing will not last forever, so call us with all of your questions. We offer many other specials and are happy to work with you to capture the "moments that will last a lifetime"! Here is our latest special for Wedgewood at Stallion Mountain. The special must be deposited by May 1, 2018. Wedgwood at Stallion Mountain* Only $525 You get: 3 hours of wedding photography with 2 photographers. 600 high resolution fully color corrected images with printing rights. 600 internet/email sized images for social media (same images as above). Online gallery for friends and family to order from our professional lab. *Offer good for booking deposited between March 1, 2018 until May 1, 2018 for booking within the 2018 year. Additional hours are billed at $200 per hour. October must book a 6 hour min. See all the beautiful couples we have captured! Paul Bloch - Thank you so much Cibele! Cibele - The one by the lake it's just stunning! Amazing job! You guys are masters of light!